Last weekend, I took my family on a short trip to Toronto, and while we were there, we visited the new Ripley’s Aquarium. (It takes just over four hours to drive to Toronto from Ottawa, where I live.) 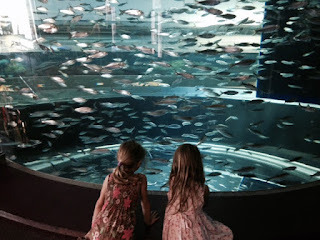 I wanted to see the aquarium for two reasons: I knew my kids would love it, and I wanted to use an aquarium setting for a scene in my upcoming Christmas novella, The Christmas Charm. 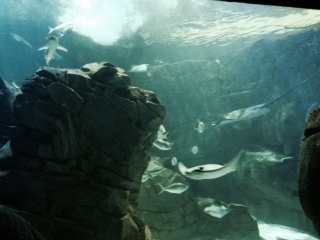 The aquarium was crowded, but all the bodies around us didn’t interfere with our enjoyment of the exhibits. We saw an impressive variety of marine life and spent hours exploring. A highlight was the “Dangerous Lagoon,” which had a moving walkway taking visitors through an underwater tunnel that surrounds you with ocean fish, stingrays and small sharks. 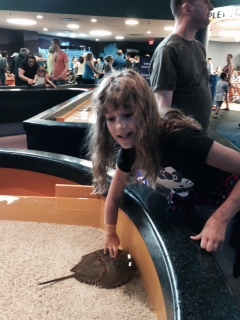 In other areas, visitors were allowed to touch horseshoe crabs and small stingrays, which willingly glided to the surface of the water to be petted. The kids were most mesmerized by the jellyfish that glowed with neon colours. 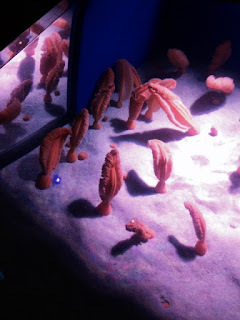 My favourite was the fleshy sea pens, which really look like pink quill pens waving at the bottom of the tank. The kids had a wonderful day, and I took dozens of photographs that I’ll need to help me work the amazing things I saw into a short scene in my story. For all of us, it was worth the trip. Want to keep up with news from Sweet Romance Reads authors? Sign up for the SRR newsletter today. Like chatting about Sweet Romance? Join the authors of Sweet Romance Reads in our cyber Café! I keep telling people research is FUN - this should convince the doubters! Thanks for reminding me about Ripley's Aquarium, Susan - it's now on my list of things to do this summer. What fun! I'm waiting for my granddaughter to get old enough to enjoy visiting the historical spots I want to research in person. That will be fun for you too! Sounds fun. I've been working on a novel for a while with a scene in Machu Pichu, but my husband isn't taking the bait that a research trip would be a good idea! That would be a fabulous trip!